By the time he was nine, Ryan Bradley had landed a double axel, triple salchow and triple toe loop. Ryan Bradley comes from a skating family. Both of his parents were skaters. He said he started when he was two because “my sister was a skater and my parents took me to the rink to keep me out of trouble.” His sister, Becky, now coaches at the rink where he trains. “I wanted to play hockey, but my mom wouldn’t let me,” he continued. “But I did in-line hockey for a while. I love to play hockey.” Bradley also enjoys other sports and played soccer, baseball, and basketball until he was 12, when he moved to Colorado to concentrate on skating. He was an all-star in both baseball and basketball. By the time he was nine, Bradley had landed a double Axel, triple salchow and triple toe loop. He regards the triple toe loop as his favorite jump but said, “The lutz is not my friend.” He’s working on two quads, the salchow and the toe loop. “I’ve got to get the triple Axel and both quads to make my mark at Nationals in seniors,” he explained. “I’ve landed both quads, but there’s just not enough consistency. 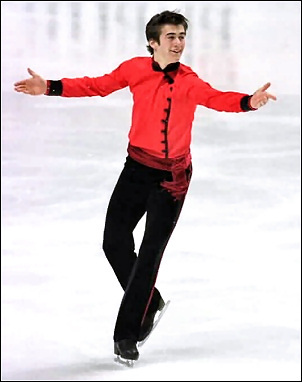 There not good enough yet to put in the program.” He finished seventh at U.S. Nationals in 2002 in senior men, and ninth this year, pulling up from 15th after a poor short program. The 1999 U. S. junior champion also skated pairs from 1996 to 1998 with Tiffany Vise and in 2001 with Melissa Gallegos, reaching the Sectionals. “I’m just focusing on singles now,” he said. “There’s not enough time to train for both.” Bradley practices for about three hours a day on ice and 2-3 hours off ice in Colorado Springs. His off ice program includes weight training, cardiovascular work, and ballet, which he began at 14. “They had to force me to go earlier, but now I enjoy it,” he said. “I go three times a week.” Tom Zakrajsek is his coach.